On February 12, 2019, VWRRC Director Schoenholtz presented an invited seminar to the Hawaii Sea Grant and Water Resources Research Center at the University of Hawaii – Manoa. His seminar provided a brief overview of some of the complex water-resources challenges in the Mid-Atlantic Region, the role of the Virginia Water Resources Research Center in addressing these challenges, and an overview of innovative approaches at Virginia Tech to train the next generation of water-resource professionals. 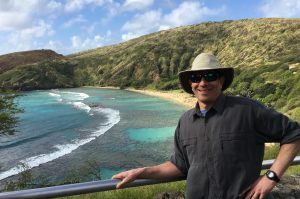 While at the University of Hawaii, Schoenholtz also served on a review panel for preproposals submitted to the Hawaii Sea Grant and Water Resources Research programs.